The best network solutions are the ones you don’t have to worry about on an everyday basis. They are there, working for you, uninterrupted. A seamless network allows for businesses to have more productivity from their employees; there is less down time because you are not waiting on a slow unreliable network. VITEC Solutions understand this concept very well, because we are not only IT people, we are business people. We recognize that there are plenty of options when looking for an IT company to manage your network solutions. Some have better reputations than others. Most offer some services but not others. No one can predict potential issues, so why chance it with a company that only offers partial coverage? 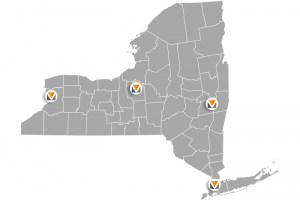 Based out of Buffalo NY, with locations all over New York, including Syracuse, Albany, and NYC. VITEC Solutions is the company that offers every network solution you could possible want, with a help desk available any time you need. We offer a one fixed monthly price that gives you everything you could possibly desire from an IT company. From antivirus protection, to printer installations, to software support and more, VITEC Solutions is there for you. Let VITEC Solutions be your only IT company. Letting us handle all your network solutions will save you time, money, and is hassle free! Call us now and let VITEC Solutions take care of your technology needs!